From Iowa State University, University Extension. Click here for the original Univeristy Extension publication in Acrobat.pdf form. The Eastern mole, Scalopus aquaticus, is the most common species of mole found throughout Iowa (figure 1). Moles belong to a group of primitive mammals called insectivores, which includes shrews. They should not be confused with rodents such as pocket gophers, which appear physically similar (figure 2), and produce similar signs (figure 3). Other superficially similar mammals also are shown in figure 2. Figure 1. Eastern mole Scalopus aquaticus. Moles live most of their lives underground, a lifestyle for which they have many unique physical adaptations. The Eastern mole averages 7 inches in length; has a streamlined body: a somewhat elongated head; and a pointed, fleshy snout. It has no external ears and tiny eyes that are capable only of distinguishing light from dark. The mole has large front feet that are broader than long and rotated to the side of the body so the palms are held vertically and pointed backward. The front feet also have well-developed claws used for digging. The hind feet are small and the short tail is thick and nearly hairless. The shiny, usually gray fur is short and velvetlike in appearance. Although no longer used in the U.S. clothing industry, millions of mole skins were once imported from Europe for use in caps, purses, tobacco pouches, and garment trimming. Townsend’s moles were once made into lady’s powder puffs. Figure 2. 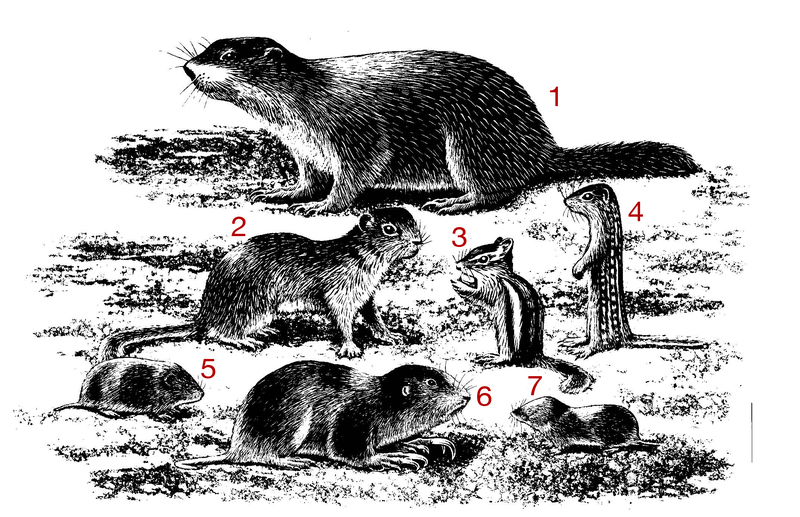 Mammals similar to the mole, (from top to bottom): (1) Woodchuck, (2), Franklin ground squirrel, (3) Eastern chipmunk, (4) 13-lined ground squirrel, (5) Meadow or prairie vole, (6) pocket gopher, and (7) Short-tailed shrew. Except for rearing of young and reproduction moles live a solitary life in an underground tunnel system of their own making. Occasionally they come to the surface to forage, to search for water or nesting material, or to search for a new home area. Flooding also will cause them to abandon their tunnels. Moles are active all year long. They are most active near the surface in the spring and fall or on cloudy, damp days during summer. The rest of the year, moles are active in the deeper permanent tunnels. Daily activity usually peaks in the cool morning and late afternoon hours, although moles may be active at any time of day. Breeding occurs once a year, usually during late winter or early spring. A litter of three to five young are born approximately 6 weeks later. Young moles grow rapidly and leave the nest at about 1 month of age. The Eastern mole has an insatiable appetite. It can consume more than its own weight in food every day. Earthworms and white grubs, insect larvae, adult insects, centipedes and millipedes, and spiders are the preferred foods, comprising about 85 to 90 percent of the diet. Vegetable matter, such as young plant shoots, and seeds of oats. corn, and grass, form the remainder of the diet. Moles dig their tunnel systems in soils that are loose for easy burrowing, moist but well drained, and that contain abundant food items. Sandy loam soil is a preferred type. Soils that are too dry, too wet, heavily compacted, full of rocks, or contain too much clay are avoided. Meadows, pastures, lawns, open woodlands, gardens, golf courses, cemeteries, playgrounds, parks, and stream banks are preferred habitats. Moles dig two basic types of tunnels: shallow, surface runways; and deep, more permanent tunnels. In addition, moles construct nest and rest chambers (figure 4). Surface runways are commonly seen as raised ridges running aimlessly through lawns, golf courses, or woodlands. Moles construct tunnels just below the ground surface as they burrow in search of food. Surface runways may be used only once; others are used frequently as main travel lanes, called main runways, and may be used for many years. Eastern moles will not tolerate any openings in their tunnel system, and they will rapidly repair all breaks in their main runways. Deep tunnels are generally from 6 to 24 inches underground—deep enough to be below the winter frost line and remain cool during summer heat. They are used regularly during the mole’s travels between its nest and rest chambers and surface runways. A mole hill is built of dirt excavated from these deep tunnels, deposited on the surface in a volcano-shaped mound through a lateral tunnel. Nest and rest chambers are enlargements of a deep tunnel, being about 8 inches long, 4 inches wide, and 6 to 10 inches beneath the ground surface. Nests are made of coarse grass and/or leaves. Nest and rest chambers are often located in protected areas underneath boulders, trees, stumps. bushes, stone piles, or fences. In open field areas they may be randomly placed in deep or surface tunnel systems. Moles tend to build their main surface runways along human-made borders such as fencerows or concrete walkways, and along wooded or shrubby edges of fields and lawns. These are usually straight and unbranched. Surface runways often branch off from the main runways and follow a crooked path toward the center of a field or lawn. Moles are incredibly efficient diggers. Moles can dig deep tunnels at rates of 12 to 15 feet per hour. Under favorable soil conditions, surface runways can be dug at the rate of about l foot per minute. The number of mounds or surface ridges seen in a yard is a poor indicator of the number of moles present. Generally, 1 acre of land will support no more than three moles. Moles are very beneficial to humans for a variety of reasons. They contribute to the formation of good, organic soil through their subsurface burrowing, which aerates and mixes the soil, and by their contribution of organic matter in the form of feces. Their deep tunnels allow air, moisture, and organic material to penetrate into deeper soil layers. Moles also eat destructive insects, such as cutworms and Japanese beetle larvae, that can cause tremendous damage to lawns and gardens. Moles are considered to be harmful when their activities conflict with human interests. Their surface ridges and mole hills disfigure lawns, golf courses, and cemeteries. While burrowing in surface runways, moles sometimes dislodge plants, damage bulbs or roots, or expose underground plant parts to the air, making them susceptible to drying. Moles occasionally consume underground plant parts or sprouting plants. Before initiating a control program for moles, decide whether the apparent damage being done outweighs the benefits. If benefits outweigh conflicts, leave moles alone and take satisfaction in knowing that better soil is being created. If moles are causing problems, Iowa law permits their removal. Where good habitat is present and nearby mole populations are high, control will be difficult. Often, other moles will quickly move into vacated areas. The proper control method will vary depending on the animal causing the damage, so it is critical to identify the offending species before proceeding. Mole damage is often confused with damage done by pocket gophers, meadow voles. and other small mammals. It is quite common for meadow voles, deer mice, and shrews to use mole tunnels. Often, these other mammals are responsible for plant damage attributed to the mole. In such cases, attempts to control moles will not lessen the damage being done. Although most people can tell the difference between moles and pocket gophers, their telltale signs are frequently confused. Mole hills can be distinguished from pocket gopher mounds by differences in shape and location of the burrow exit (figure 3). Mole hills appear volcano-like. Moles push dirt vertically from the burrow exit to form a symmetrical cone with no visible sign of an exit point. Excavation of the mole hill reveals an exit point in the center of the cone at ground level. In contrast, dirt excavated from a pocket gopher’s tunnel system is pushed from the burrow exit and deposited in a fanlike mound around the burrow exit, with the exit at the focus of the fan. The pocket gopher burrow exit is a visible plug of dirt. Figure 3. Comparison of mole and pocket gopher signs. Figure 4. Surface and cross-sectional views of a typical mole tunnel system. Trapping is the most reliable method to control moles in noncommercial situations. Trapping is practical and effective for the home owner and small farmer, but time consuming and uneconomical for large farms, and commercial bulb or produce growers. The keys to trapping success are patience. practice, and persistence. Moles are not easy to trap. They will evade, spring, heave out, or go around improperly set traps, and even some traps that are properly set. It is important that traps be placed carefully, and that enough time is allowed to capture the offending animals. Trapping is easiest and most effective during the spring and fall when mole activity is highest. However, trapping should be effective any time active burrowing is observed. For successful trapping, it is essential to locate main runways, which can be both surface runways and deep tunnels. Usually, if a surface runway follows a straight path for some distance or seems to connect two runway systems, it is likely to be a main runway. Determine whether a surface runway is active by poking small holes into it at several locations. Moles will repair holes in their main runways within a day’s time. Runways left unrepaired are not worth trapping. Since nest and rest chambers are commonly located at a protected spot along a hedgerow or fencerow, trapping at places where runways enter the yard, field, or garden is often quite successful. There are two commonly used mole traps on the market, the harpoon trap, available from most hardware or farm and garden stores, and scissor jaw traps, which may have to be ordered from the manufacturer. To properly set a harpoon trap on a surface runway, first lightly press down on a small section of an active runway with your foot or a shovel so the runway is collapsed to about one-half its original height (figure 5). Do not collapse the runway too firmly. Second, raise the spring of the trap and set the safety catch. Next, push the supporting spikes into the ground, one on either side of the runway, until the trigger pan just barely touches the surface of the depressed runway. Be sure the trap is centered over the runway and the supporting spikes do not cut into the tunnel. Release the safety catch and spring the trap to ensure that the prongs penetrate easily and smoothly into the tunnel. Finally, reset the trap and leave it, taking care not to step on or otherwise disturb the runway system. To set a scissorjaw trap in a surface runway, dig out a straight portion of the runway approximately the width of the trap, and repack it loosely with fine soil (figure 6). Force the jaws of the trap directly into the fine soil until the trigger pan rests on the repacked soil surface. Then. push the levers apart at the top of the trap until the trap is locked. Figure 6. Setting a scissor-jaw trap. Center the trap on the runway so the mole must pass directly between the open jaws. The bottom tips of the jaws should cut into the floor of the tunnel about 1/4 to 1/2 inch. An alternate method of placing the scissorjaw trap in a surface runway is to simply push down a small section of the ridge with your foot, and force the jaws directly into the runway until the pan rests upon the pushed-down surface. Then push the levers apart and lock the trap jaws in place. Make sure the trap is centered on the runway opening and that the jaws cut into the floor of the tunnel slightly. It may be necessary to scrape off some dirt or grass from the top of the mole ridge in order to bring the trap down so the jaws enclose the entire burrow. Trapping will be most productive when traps are place d in deep tunnels that are used on a daily basis. To find these tunnels, probe the ground around a mole hill with a sharp stick or rod until the runway is located (figure 7). Probe at least 12 to 18 inches away from the mole hill to avoid the exit tunnel. Using a shovel or trowel, cut out a section of the runway about the width of the trail. Replace some of the excavated soil, building a firm plug for the trigger pan to rest on. Proceed to set either trap in the manner dese ribed before, then fill in around the trap with loose soil to exclude any light. The mole will be trapped when it attempts to clear the tunnel. Mark the trap location and check it every 8 to 12 hours. If there is no result within 2 to 3 days, remove and relocate the trap. Regardless of which trap is used, set the trigger so it will spring easily with the slightest disturbance. Figure 7. Placement of harpoon (a) and scissor-jaw trap (b) in deep tunnel system. Locate tunnel with a metal probe (c). Moles can be captured alive with a little extra effort. When fresh burrowing activity is noted. it may be possible to dig the moles up. Simply approach very quietly to where the earth is being heaved up and make a quick strike of a shovel blade directly behind it. You should scoop up soil and a surprised mole. With gloved hands, quickly grab the mole before it has time to burrow back into the soil, and place it in a bucket. Relocate the mole to a field away from residences. A more time-consuming and less successful method is pittrapping. Bury a 3-pound coffee can in the floor of the mole tunnel and cover the top of the burrow with a board to exclude all light. Cave in the runway just in front of the can on both sides. The mole will fall into the pit as it tries to clear the tunnel. Professional pest control operators agree that trying to kill moles with poisoned baits or poisonous gases is undependable and generally ineffective. Poisoned baits are generally ineffective because moles feed primarily on earthworms, grubs, insects, and spiders and rarely consume the seeds or nuts usually used as baits. In addition. Baits pose a hazard to other wildlife (which are more likely to consume vegetable material) using the tunnels, and to domestic animals that may dig up the tunnel and consume the baits. Gases are ineffective because they either do not penetrate the runway system adequately or diffuse out through the top of the surface tunnel. Some people claim that moles can detect noxious gases and wall off a portion of the tunnel where they are detected. This publication was reviewed by Dr. Terry L. Yates, University of New Mexico.